Leave it to me, a Biblical numismatist (coin collector) and a born-again creationist, to see connections between those two favorite topics of mine…. 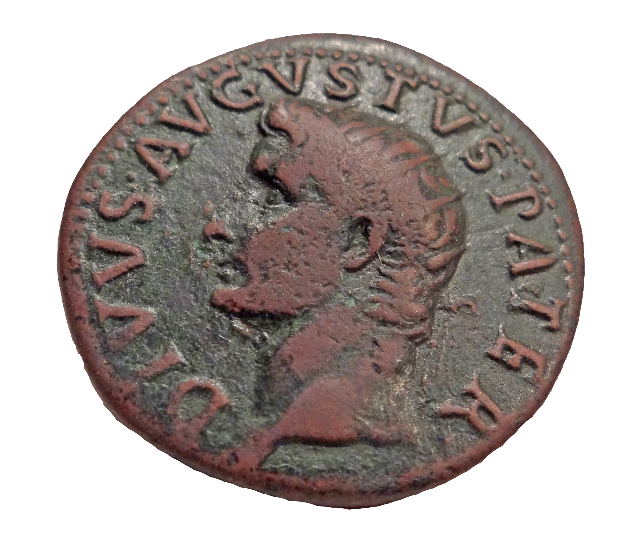 In continuing the series on Biblical coins today we’ll focus on the large Roman coin called the “assarius.” These half dollar-sized bronze coins were worth ten to the denarius. These were imperial coins, meant to circulate around the Roman Empire. And they were the First Century’s way of conveying government propaganda to the farthest reaches. The example we are showing is a commemorative piece struck by Tiberius. With it he is honoring his late adoptive father Augustus Caesar. 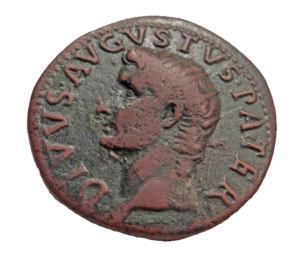 On the obverse we see Tiberius’ bust with the following inscription: “DIVUS AUGUSTUS PATER.” That is, “Father Augustus the god.” Of course, this is another way of saying that he, Tiberius, is a “son of god,” too. Jesus mentions the assarius as what “two sparrows are sold for.” But the text relates well to the great subject of origins and God’s image. “And I tell you that not one of them shall fall without the Father.” Matthew 10:29 ASV. Yes, the American Standard Version catches it best, as they don’t supply the word “will” as do other versions. The sparrows don’t fall with “the Father’s will.” No, they don’t fall alone! Theistic evolutionists believe that sparrows do and did fall with the Father’s will. In fact, God designed death as a part of creating sparrows. But that image of God is contrary to what Jesus said. In essence He was saying that people believe sparrows are worth two for a penny (assarius), but God feels the loss of every one of them. “Fear not,” Jesus continued, “for you are worth more than MANY sparrows.” However, He didn’t say that we were worth more than ALL sparrows. All of God’s creation are valuable to Him.